Here are job overviews and descriptions for all call centre roles, from a Call Centre Advisor to the Manager. 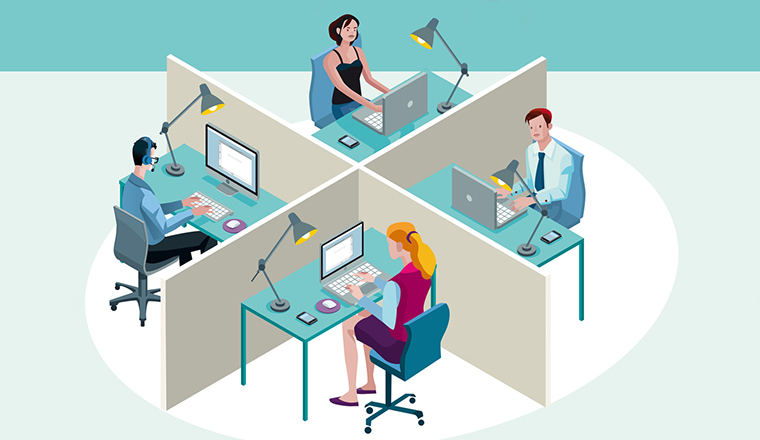 What Are the Typical Roles in a Call Centre? Within a call centre there are common roles: a Centre Manager, Team Leaders and Advisors. There are also other functions such as HR, Trainers or Operational Management that play a vital role. The following information could come in useful when trying to set up a call centre, or just familiarise yourself with the industry. The size of the centre will determine the number of Team Leaders and additional support roles. For the typical skills each member of the call centre has, read this article on Skills and Competencies for Roles in The Call Centre. 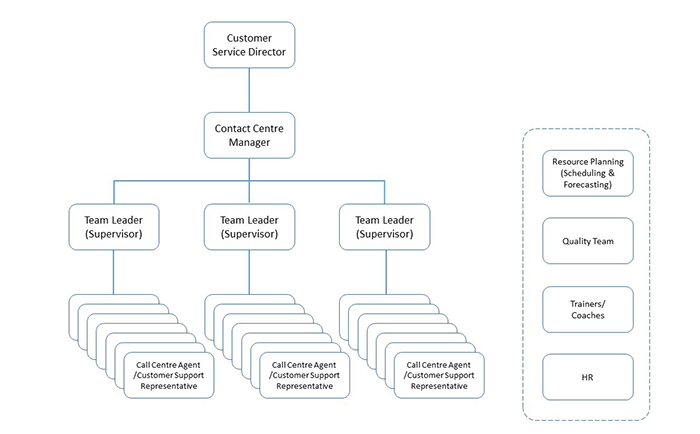 A flow diagram of the typical structure and roles within the call centre. For a full list of names used to refer to this role, read our piece: What Should We Call Frontline Call Centre Staff? In principle, this role is to handle telephone calls on behalf of an organisation, to fulfil customer requirements. This generally involves customer calls coming into the contact centre, which are known as inbound calls. However, an Advisor may also contact customers themselves, maybe for market research purposes or perhaps to sell them something. These are known as outbound calls. In addition to phone calls, Advisors often communicate with customers via email, webchat and post. Advisors are often referred to by other names, including: Agents, Customer Service Representatives and Associates. In this piece, we have compiled the best qualities of a contact centre advisors. It is worth noting that an individual Advisor in unlikely to perform all of the duties listed above. Instead, factors like the nature of the company behind the call centre and the Advisor’s personality are likely to influence the roles that they might perform. Or, as is the case in many call centres, Advisors may be blended, i.e. they both take inbound and make outbound calls. However, if the roles are split, a call centre advisor who is primarily involved in selling may typically earn a lower base salary than those who provide customer service. But they will earn commission, so the overall salary could be much higher, if the sales Advisor delivers results! A Team Leader, often known as a supervisor or a Team Manager, is responsible for managing a team of Advisors. Read more about the difference between being a manager and a leader here. The Team Leader’s responsibilities are to ensure individual Advisors are performing against targets, while reviewing their performance and coaching them to do so. There is much more to the position than just that, though, as multi-tasking is very much central to the role. 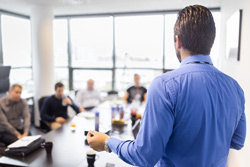 For example, Team Leaders are also expected to meet on a regular basis with their Manager, both to provide feedback and to receive instructions or actions. We have a article on How to be a Leader in the Contact Centre. A general list of duties, including keeping Advisors informed of what is happening in the centre and anything that may affect them, is listed below. Despite the long list of duties that make up the job description, it is also not uncommon for Team Leaders to get involved in the recruitment of new Advisors or to work on specific projects for the centre. For more information on making sure you pick the best team for your contact centre, read this article on How to Choose Your Contact Centre Team. Also, many contact centres would view a Team Leader who is tech-savvy as a significant bonus, with a knowledge of relevant computer programs and telephone software. 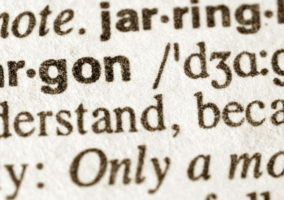 Speaking another language and being a good negotiator may also be helpful, depending on the nature of the organisation. Typically, a Team Leader will look after a team of eight to twelve Advisors. This is the person who is ultimately responsible for the overall performance and budget of the centre. They will make decisions regarding the people, the processes, the technology and the customers that are part of the call centre and the future strategy and development of the centre. In addition to this, the Call Centre Manager is usually the person who liaises with other departments such as HR, IT, and, especially if it is a sales centre, Sales and Marketing. In this article we talk you through 6 Steps to Becoming a Confident Call Centre Manager. Other duties include being responsible for recruitment, development and coaching. A full list is presented below. 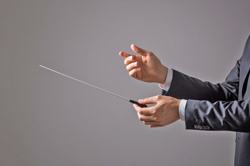 Read this article for 3 Essential Management Routines for a Contact Centre Manager. 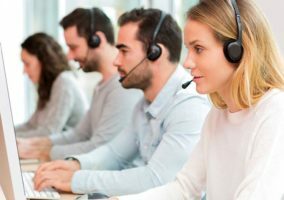 Following on from these skills, we’ve compiled a Five Phrases a Call Centre Manager Should Use and Five Phrases a Call Centre Manager Should Never Use. 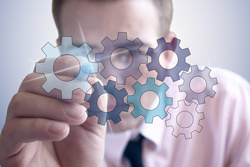 From the duties listed above, it is clear that the role has a strong “hands-on” element to it. In fact, depending on the size of the centre, the Call Centre Manager will also have a number of Team Leaders (or Assistant Managers for larger centres) reporting to them. This can be seen in , carried out in 2016, which reported the average agent to team leader ratio is less than 10, but the majority of team leaders have a larger team than this. 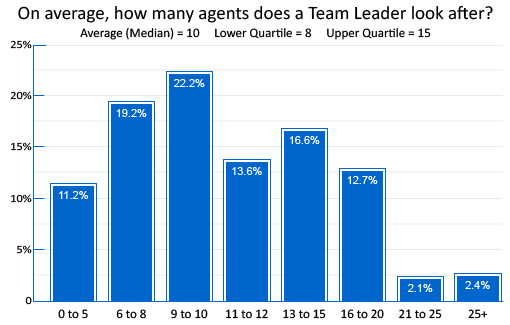 A poll showing that the average number of agents to team leader is 10. Being in a hands-on role also requires other skills in coaching and negotiating, verbal English, as well as having a high work ethic, to lead the call centre from the front. Contact Centre Heads lead contact centre operations of various sizes. Typically this is a fast-paced area of business that is challenging and changing continuously. Someone in this position would be expected to shape the future of the contact centre operation, to improve the customer experience through each available channel. Take a look at whether your Contact Centre is Prepared for the Challenges of 2020. Typically, the Head of the Call Centre would report to the Customer Services Director or Managing Director and would be held accountable for the performance of all call centre teams. Yet there is much more to the role, as highlighted in the duties listed below. For useful information on managing your call centre, take a look at our articles about call centre management. In addition to each of the duties specified above, the Head of the Call Centre often shares duties with the Call Centre Manager. This can include quality assurance and ensuring compliance to regulatory and legal obligations, as well as harnessing the voice of the customer and driving performance. The Customer Service Director is a key strategic and operational leadership role. Whoever is in this position will be responsible for the development, continuous improvement and delivery of customer service. In addition, the Customer Service Director will be accountable for the strategic development of operational requirements, processes and technology, with aim of delivering key service outcomes for customers in either a B2B or B2C environment. Take a look at our articles on Customer Service Strategy, for some ideas to improve your contact centre. The role has significant levels of responsibility and accountability for operational delivery and includes tasks such as those listed below. Although the job mostly involves strategic and operational duties, a Customer Service Director also has an important responsibility of interpreting management information and developing strategies and making recommendations to further customer service.Take a look at these contact centre goals. For example, if First Contact Resolution Rates are perceived to be too low, it would be up to the Customer Service Director to develop ideas for improving the score. Ideas such as creating a survey, mystery shopping or improving calibration. The role is primarily responsible for the uptake of digital channels and customer contact efficiency across digital service lines. Furthermore, it is the responsibility of the Digital Contact Director to deliver a service that does not compromise existing revenue, service and margin position. Also, it is up to the person in this role to lead the creation/development of a digital contact strategy, researching, proposing and designing the correct digital channels that match brand image and ambitions. Click here for Ways to Improve the Effectiveness of Your Digital Customer Service. While skills in digital design are essential, it is also imperative that a Digital Contact Director is a customer experience expert who understands how technology can be used to improve the customer journey. Click here to discover how customer journey mapping can improve your digital customer service. With this in mind, it would be expected that a candidate for this position would have experience of digital transformation in a similar organisation. This is so the contact centre has full belief in any digital proposition that the Digital Contact Director puts forward. As a support role in larger centres, the Operational Manager would tend to look after the operational elements of the contact centre. A person in this role would also be expected to liaise with the Team Leaders and the Call Centre Manager regarding performance management information, and they would usually be the link with the IT department or technology suppliers. So an Operations Manager would have to be good with statistics and technically minded, while communicating with all levels of the contact centre. Read this article to understand the Key Components of a Call Centre Operation. Being the Operational Manager also means being in charge of an operations team, potentially across multiple sites, to deliver a consistent customer experience. For a successful operation, read these 9 tips. This factor alone means that there are additional skills required for someone in this role. Skills such as the ability to encourage, manage and inspire groups of people, while ensuring operational excellence, service improvement and engagement. The primary duty of the Resource Planning Manager is to lead the team that plans the effective utilisation of the workforce, forecasting and scheduling. However, that is not all, as some Resource Planning Managers will also have responsibility for the production and delivery of MI (Management Information) and will carry out duties like those listed below. For some great resources for planning in your call centre, take a look at our articles about planning. While the Resource Planning Manager will likely have to contribute to all the duties listed above, it is also important that their schedules, forecasts and plans are commercially viable. This requires customer focus and good communication with other contact centre departments. So it may also be important for someone in this role to be business aware, have good customer knowledge and flexibility. There needs to be a very close relationship between HR and the call centre due to HR’s ongoing people activities such as recruitment and training. Depending on the company, there may be HR resources within the call centre. Usually HR are responsible for ensuring that terms and conditions of employment and job descriptions are all in place, as well as organising recruitment and possibly training for the call centre. They also deal with issues that individuals may have personally or professionally. Some centres have trainers as part of the overall team because of the high volume of induction and ongoing training that is required. They are responsible for preparing and delivering training to the agents in the centre. In larger centres, in addition to the Team Leader, each team may have a team coach who will provide additional support and technical knowledge to the agents. This is usually someone who has been a very good agent and has a good way of getting information over and helping someone to improve their performance. We have some tips on training the trainer, to help it work in your call centre. Have we missed any common call centre roles on our list? If so, please let us know in an email to Call Centre Helper. Many thanks to Paul Weald for helping to provide some of this information. Thanks for the information it’s helpful to me.